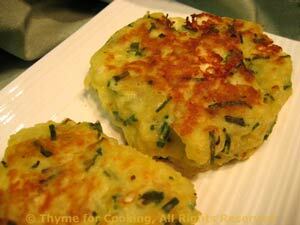 Potato Cakes with Feta and Chives, Thyme for Cooking easy side dish. I like Potato Cakes well enough that I don't always wait for leftover mashed potatoes to make them. The potatoes only take about 12 minutes to cook, and they are a bit drier than traditional mashed, letting the cakes stay together well, even with the feta. Peel the potatoes and cut into chunks. Cook in rapidly boiling water until very tender, 12 - 15 minutes. Drain the potatoes and mash with a fork or potato masher. Spread the mashed potatoes on a plate to cool for 5 minutes. Cut or crumble feta into small pieces (pea size). In medium bowl whisk egg, milk and chives. Add potatoes and mix well. Divide into 4 equal portions. Heat oil in large nonstick skillet. Add potato portions, forming into patties in the skillet, about 1/2" (1.25cm) thick. Fry until brown on one side, about 7 minutes. Turn and brown the other side. Remove and serve.